After launching video calls with Google Hangouts, Google may be looking at transforming regular teleconference calls with a new app and service called GMeet. Screenshots of the unannounced app were uncovered by Google+ user Florien Kiersch, revealing that teleconference calls could be easily joined with a single click, rather than requiring users to dial in a string of numbers to enter a room. Florien claims that the service is only open to Google employees, but it's unclear if GMeet is intended solely for Google employee use, or if it's undergoing internal testing ahead of an official reveal. Google has not publicly announced its plans for such a service at this time, and this is the first that we've heard of GMeet. The screenshots reveal that the smartphone-based app uses Google's latest Material Design language that debuted with Android 5.0 Lollipop. From what we can tell based off of the leaked shots, Google Meet would work in a similar way as Google Hangouts, allowing for voice and/or video calls to be conducted over the service. Conference calls will likely be routed over the internet, similar to VoIP calls made on Google Hangouts or Google Voice today. The service could be useful for enterprise customers, particularly those who use Google Apps for Work, as one of the screens show a meeting agenda with quick, clickable links to join various upcoming teleconference sessions. There is also a search tool to find existing meetings to join, likely reserved for users within the same organization, or under the same Google Apps domain. The ability to quickly join conference call rooms will be a useful time-saver for business customers. By clicking on a link, users will no longer need to remember a dial-in number to reach a teleconference service, nor would they need to key in the room code to join a teleconference session. Additionally, sending a link to customers, guests, or participants of a teleconference call is much easier than requiring them to dial into a conference service. Phandroid reports that searches for GMeet and Google Meeting returned code snippets dating as far back as 2011, but that "most of the code references things we already have access to in the latest rendition of Hangouts, such as whiteboards, screen sharing, and integration with Google Calendar." Likely, if GMeet debuted, it would provide users with an app and UI that works on top of the existing Google Hangouts infrastructure. 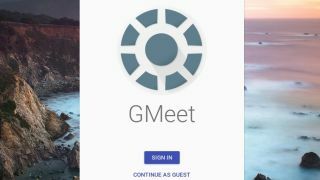 In addition to an Android app, Kiersch noted in his post that there appears to be a Chrome extension, so users of Chrome OS and the Chrome browser can also easily access GMeet.